"The real engine fueling rising income inequality is `firm inequality': In an increasingly winner-take-all or at least winner-take-most economy, the best-educated and most-skilled employees cluster inside the most successful companies, their incomes rising dramatically compared with those of outsiders. This corporate segregation is accelerated by the relentless outsourcing and automation of noncore activities and by growing investment in technology." So argues Nicholas Bloom in his essay, "Corporations in the Age of Inequality," which appears as a cover story in the March 2017 issue of the Harvard Business Review. The basic idea won't be new to long-time readers of this blog. For example, I discussed some earlier work by Bloom together with co-authors Jae Song, David J. Price, Fatih Guvenen in "Earnings Inequality Between Companies" (July 6, 2015) and a study by the OECD on this subject in "Productivity Growth and the Diffusion Problem" (July 14, 2015). But this essay is a very nice compact and readable overview of the work. As a starting, instead of looking at the distribution of income between people, look at the distribution of average salaries across companies. 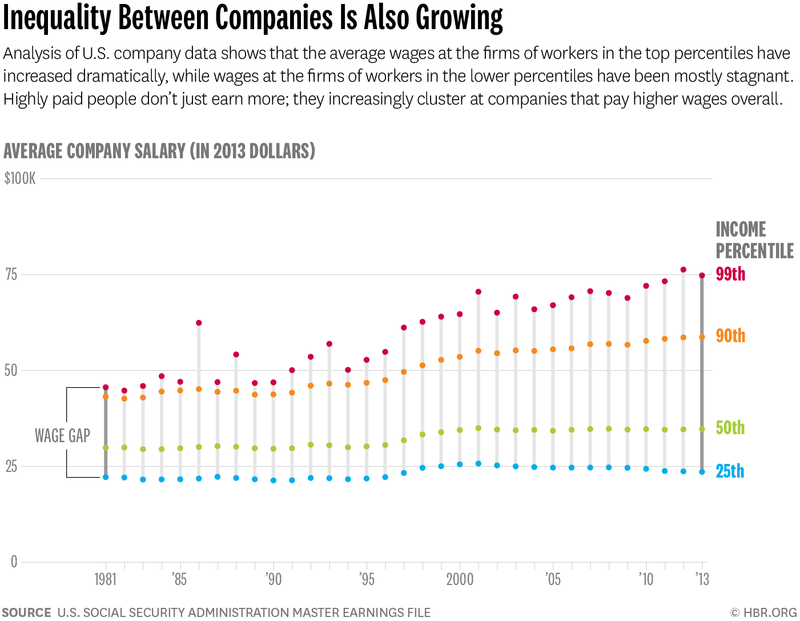 As this figure shows, average salaries for companies in the 99th percentile of companies has grown substantially, while average salaries at the 25th and 50th percentile of companies hasn't grown much. 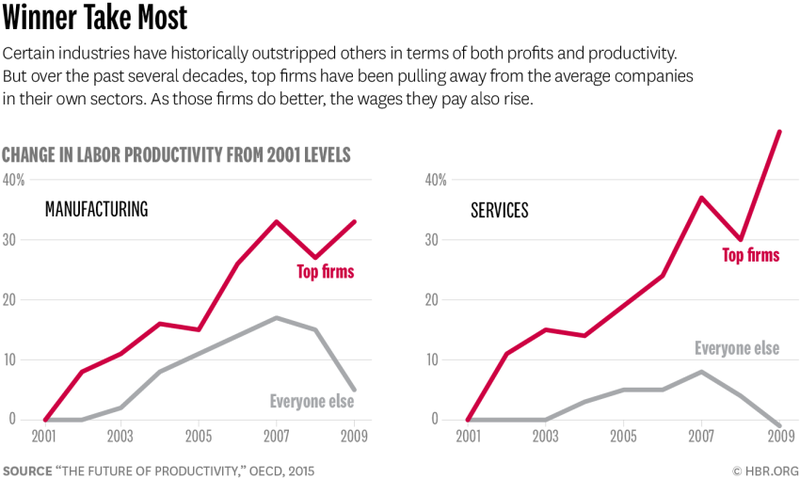 This pattern is also apparent within industries: that is, if you just look at manufacturing firms, or just look at services firms, the labor productivity of the top firms is pulling away from the labor productivity of other firms. Here's a figure from Bloom's essay, drawing on the OECD study mentioned earlier. "In other words, the increasing inequality we’ve seen for individuals is mirrored by increasing inequality between firms. But the wage gap is not increasing as much inside firms, our research shows. This may tend to make inequality less visible, because people do not see it rising in their own workplace. This means that the rising gap in pay between firms accounts for the large majority of the increase in income inequality in the United States. It also accounts for at least a substantial part in other countries, as research conducted in the UK, Germany, and Sweden demonstrates. ... I believe that much of the rise of between-firm inequality, and therefore inequality in general, can be attributed to three factors: the rise of outsourcing, the adoption of IT, and the cumulative effects of winner-take-most competition." "Employees inside winning companies enjoy rising incomes and interesting cognitive challenges. Workers outside this charmed circle experience something quite different. For example, contract janitors no longer receive the benefits or pay premium tied to a job at a big company. Their wages have been squeezed as their employers routinely bid to retain outsourcing contracts, a process ensuring that labor costs remain low or go ever lower. Their earnings have also come under pressure as the pool of less-skilled job seekers has expanded, due to automation, trade, and the Great Recession. In the process, work has begun to mirror neighborhoods — sharply segregated along economic and educational lines." The rise of between-firm inequality raises some social questions that go beyond the general issue of inequality between individuals. For example, it suggests that in the past, successful firms were more likely to have played a role in redistributing income, in the sense that all the employees of a successful firm tended to share, at least to some extent, in the firm's success. In the past, successful firms could offer a kind of career ladder, where a combination of experience and training helped some of their entry-level workers move up to middle-class jobs. In the past, successful companies offered a kind of integration across high-wage and low-wage jobs, because people in all kinds of jobs were more likely to have a common employer. In contrast, a rise in between-firm inequality suggests that the US and other leading economies are becoming a more economically segregated, in the sense that those with high pay and those with lower pay are becoming less likely to have the same employer. It means that the classic "American dream" success story, of someone being hired in the mailroom or as a secretary or janitor, and then getting promoted up the company ladder, is less likely to occur. Nowadays, those jobs in the mailroom or the secretarial pool or the janitorial work are more likely to involve working for an outside contractor. In that sense, some of the rungs on the bottom of the ladder of success have been sawed off. There is considerable concern among economists and social scientists that the Trump administration will take a hatchet to the government statistical programs. I find it difficult to argue for the value of government statistics, because their value seems so obvious to me that it is hard for me to imagine someone who both disagrees with me on this point but is potentially persuadable. However, Nicholas Eberstadt, Ryan Nunn, Diane Whitmore Schanzenbach, and Michael R. Strain have taken on the job a March 2017 working paper, "“In Order That They Might Rest Their Arguments on Facts”:The Vital Role of Government-Collected Data." The authors are from both the Hamilton Project at the Democratic-leaning Brookings Institution and the Republican-leaning American Enterprise Institute. They point out that total federal spending on statistics is about 0.18% of the federal budget--and just to be clear, that's not 18%, but rather a little less than one-fifth of 1 percent. As the authors point out in detail, with examples, the potential benefits of this information are considerable. The federal budget is about $3.6 trillion, and of course the federal regulatory apparatus imposes additional costs. Information helps to direct government spending, taxes, and regulations, and it helps citizens to hold their government accountable. In addition, businesses and households often build on government statistics when making their own plans and decisions, thus allowing the economy to function more smoothly than if this information was only available, in partial chunks, from private providers. "This kind of information, he observed, all Legislatures had wished for; but this kind of information had never been obtained in any country. ... If the plan was pursued in taking every future census, it would give them an opportunity of marking the progress of the society, and distinguishing the growth of every interest. This would furnish ground for many useful calculations, and at the same time answer the purpose of a check on the officers who were employed to make the enumeration ... And I am very sensible, Mr. Speaker, that there will be more difficulty attendant on the taking the census, in the way required by the constitution, and which we are obliged to perform, than there will be in the additional trouble of making all the distinctions contemplated in the bill. ... I take it, sir, that in order to accommodate our laws to the real situation of our constituents, we ought to be acquainted with that situation. It may be impossible to ascertain it as far as I wish, but we may ascertain it so far as to be extremely useful ... If gentlemen have any doubts with respect to its utility, I cannot satisfy them in a better manner, than by referring them to the debates which took place upon the bills, intend, collaterally, to benefit the agricultural, commercial, and manufacturing parts of the community. Did they not wish then to know the relative proportion of each, and the exact number of every division, in order that they might rest their arguments on facts, instead of assertions and conjectures?" The modern arguments for government statistics are pretty much all there. From my perspective, I would only add that it's very useful to have statistics that are publicly available, and where the methods are openly discussed. You might not like, say, exactly how the poverty line is defined, or how the government statistics draw the line between those counted as unemployed and those counted as "out of the labor force," but at least the method is clear and the same method is used over time. The process is isolated from politics in various ways. For example, the many tasks involved in producing government statistics are typically divided up so that no one person can tell what the results will be until the end. Groups of outside experts are called in on a regular basis to evaluate and critique. Politicians have limited input to the actual data process. For example, "In the case of the BEA [Bureau of Economic Analysis], political appointees have very limited access to the data until after journalists receive them—one hour before the estimates are made public— further ensuring the impartiality of the process .."
I'm all for managing every little sliver of the budget as effectively as we can. But to me, government statistical programs are part of what makes citizenship possible. "A substantial portion of our official statistics is produced by the 13 agencies that have statistical work as their principal mission. Excluding funding for the decennial census, approximately 38 percent of overall funding for Federal statistical activities provides resources for these 13 agencies. The principal statistical agencies are the: Bureau of Economic Analysis; Bureau of Justice Statistics; Bureau of Labor Statistics; Bureau of Transportation Statistics; Census Bureau; Economic Research Service; Energy Information Administration; National Agricultural Statistics Service; National Center for Education Statistics; National Center for Health Statistics; National Center for Science and Engineering Statistics; Office of Research, Evaluation and Statistics (SSA); and Statistics of Income (IRS). ... The remaining 62 percent of total resources allocated to statistical work in the U.S. Government is carried out by about 115 programs in the Executive Branch that conduct statistical activities in conjunction with another program mission, such as providing services (for example, medical care benefits for the elderly and the poor) or enforcing regulations (for example, with respect to the environment, transportation, or occupational safety). ... Additionally, there are other Federal agencies whose statistical activities are excluded because they are not part of the Executive Branch. These agencies include the Congressional Budget Office, which develops and applies projection models for the budgetary impact of current and proposed Federal programs; the Federal Reserve Board, which compiles the widely used Flow of Funds report and other monetary statistical series and periodically conducts the Survey of Consumer Finances; and the U.S. Government Accountability Office, which develops statistical data in evaluations of government programs." Mr. Madison observed, that they had now an opportunity of obtaining the most useful information for those who should hereafter be called upon to legislate for their country, if this bill was extended to as to embrace some other objects besides the bare enumeration of the inhabitants; it would enable them to adapt the public measures to the particular circumstances of the community. In order to know the various interests of the United States, it was necessary that the description of the several classes into which the community is divided should be accurately known. On this knowledge the Legislature might proceed to make a proper provision for the agricultural, commercial, and manufacturing, interests, but without it they could never make their provisions in due proportion. This kind of information, he observed, all Legislatures had wished for; but this kind of information had never been obtained in any country. He wished, therefore to avail himself of the present opportunity of accomplishing so valuable a purpose. If the plan was pursued in taking every future census, it would give them an opportunity of marking the progress of the society, and distinguishing the growth of every interest. This would furnish ground for many useful calculations, and at the same time answer the purpose of a check on the officers who were employed to make the enumeration; forasmuch as the aggregate number is divided into parts, any imposition might be discovered with proportionable ease." And I am very sensible, Mr. Speaker, that there will be more difficulty attendant on the taking the census, in the way required by the constitution, and which we are obliged to perform, than there will be in the additional trouble of making all the distinctions contemplated in the bill. The classes of people most troublesome to enumerate, in this schedule, are happily those resident in large towns, the greatest number of artisans live in populous cities, and compact settlements, where distinctions are made with great ease. I take it, sir, that in order to accommodate our laws to the real situation of our constituents, we ought to be acquainted with that situation. It may be impossible to ascertain it as far as I wish, but we may ascertain it so far as to be extremely useful, when we come to pass laws, affecting any particular description of people. If gentlemen have any doubts with respect to its utility, I cannot satisfy them in a better manner, than by referring them to the debates which took place upon the bills, intend, collaterally, to benefit the agricultural, commercial, and manufacturing parts of the community. Did they not wish then to know the relative proportion of each, and the exact number of every division, in order that they might rest their arguments on facts, instead of assertions and conjectures? Will any gentleman pretend to doubt, but our regulations would have been better accommodated to the real state of the society than they are? If our decisions had been influenced by actual returns, would they not have been varied, according as the one side or the other was more or less numerous? We should have given less encouragement in some instances, and more in others; but in every instance, we should have proceeded with more light and satisfaction. One of the distressing issues for the US economy has been the slow pace of investment, which is probably part of what made the US economic recovery sluggish in the last few years, and threatens to be part of a "secular stagnation" outcome of lower productivity growth in the years to come. In a globalizing economy, it's possible that one reason for low investment in the US (and other high-income economies) is just that the investment opportunities look better in emerging market economies. At least, this is an obvious interpretation of a figure from Thomas Klitgaard and Harry Wheeler in "The Need for Very Low Interest Rates in an Era of Subdued Investment Spending" (March 22, 2017), which appeared on Liberty Street Economics, a blog run by the Federal Reserve Bank of New York. The figure points out that investment as a share of GDP was about the same in emerging markets and advanced economies in 2000, but since then, the investment/GDP ratio has risen in emerging markets and fallen in high-income countries. I'm sure this isn't all of the reason for stagnating US investment, but it's likely to be a piece of the puzzle. "Economics is a field that has at best 200 years of systematic study. More likely we have less than a 100 year of actual systematic and sustained study. The budget for research in the US, or even in the UK, that goes to economics maybe just 1/1000 of the pounds or dollars that are invested in infectious diseases. "Given the incredibly small amount of resources that we invested in economics, given the fact that economics have been studied for only 200 years where in medicine we have been studying infectious diseases in a systematic way for 2000 plus years, I think it is quite remarkable that economics models do such a good forecasting job when compared to infectious diseases models. "We do not think that medicine is in a crisis whenever a new virus appears, even if that virus turns out to be quite deadly. Again, they have a budget that is a thousand time bigger than ours. They have hundreds of more people working on it. They have been doing ten times more years than we have in economics. If you think about that in this perspective, I actually think the performance of economics, compares to other fields of knowledge, is actually not bad at all." "When we look back at the financial crisis, the main question is why economists did not predict what has happened in 2007 to Bear Sterns and Lehman Brothers. Economists felt that they have a bunch of apparatus that allow us to understand what was going on. So it was a failure of forecasting but not a failure of understanding. "No, we had all sorts of ways to think about it. We may not have forecast it but we have some tools. What you have seen is that as we have the tools, there were attempts using them, attempts in understanding in what ways those tools were lacking, and attempts in improving those tools and understand them better. But there was not a feeling that we do not even have the tools to even understand what was going on." "In the last six years, the world of central banking, the way central banks operate, the way they set monetary policy, has changed radically. Even most people I admired don’t even quite understand it. The main radical change is that we went from a system in which central banks do the so-called open market operations, where they brought a few million bonds here and there, and in doing so affect the interest rate. Back in the days, central banks were using a fairly tiny balance sheet. 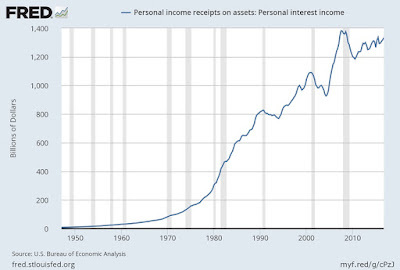 Now we instead have a system which central banks’ balance sheets are very large. 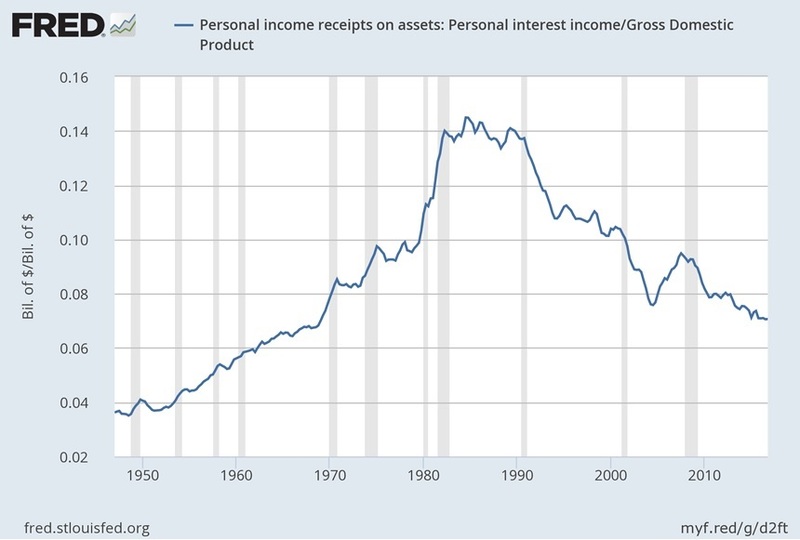 "Why are the balance sheets very large now? Because on the liability side, there are a huge amount of reserves, i.e. the deposit of banks in the central bank. That means nowadays that the way that central banks actually control inflation is not through some Federal Reserve fund market, nor some interbank markets in the Europe, but rather by actually choosing an interest rate on reserves. 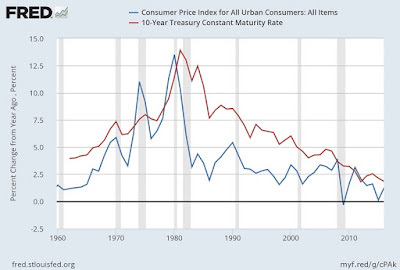 It is not like the target of the Federal Fund rate, it is an actual interest paid by the central bank. ... Reserves in the central banks used to be an asset that was essentially zero on the balance sheet. 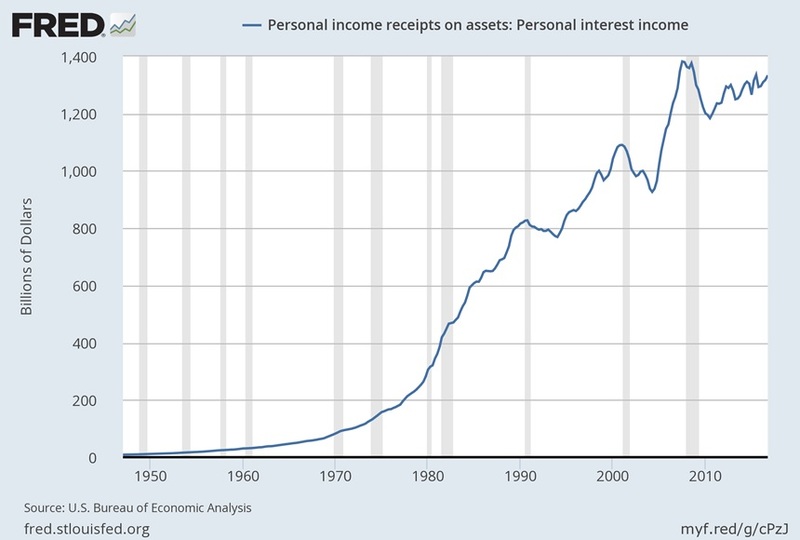 ... Now it is one of the largest financial assets in the US. So, we have this new asset which is fundamental to the financial market, to the monetary policy, and it has fundamentally changed what the central bank balance sheet does. "A lot of my research in last year has been focused on understanding what does it mean and what does it imply for the control of inflation, for the risk of central bank insolvency and among others. That’s what I called Reservism, trying to understand what is the role of this new asset called reserve has on the economy and the central bank policy. "Once you understand that these reserves in the central banks are very large, the next thing one can do to understand what effect they have is to try to understand to what extent they could be different. Reserve right now are overnight deposit in central bank by banks, they are paid a given interest rate but once you started thinking about what they are, you realized that those could be different. They could, instead of promising an interest rate, promising a different payment. They could be, instead of overnight, a 30-day deposit. They could be lots of different things. That is what led to some of the more recent research. What about a monetary policy of paying an inflation-adjusted interest rate on bank reserves? "The intuition is as following: the reserve is a very special asset that has one particular property – reserves are the unit of account in the economy. One dollar of reserves defines what the dollar is. ... [R]eserve is the unit of account of the economy. One unit of reserve always worth one dollar. "The [inflation-adjusted interest] payment on reserve rule, on the other hand, is not what we called a feedback rule. 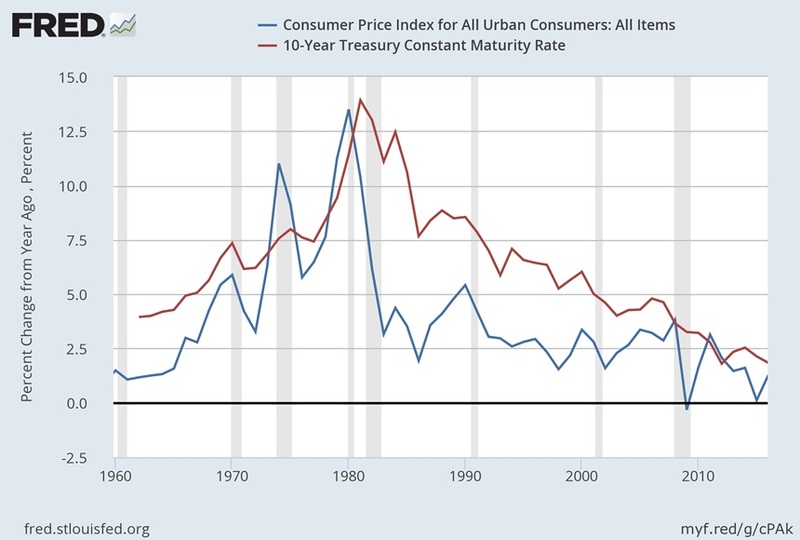 It doesn’t say how you should adjust interest rate to what inflation is at some point. .... [I]n the Taylor Rule [for monetary policy] one needs to track not just current inflation but also certain things like natural rate of interest or natural rate of unemployment to know how to adjust the nominal interest rate. Under the payment on reserve rule, what you need to track is not any of these natural and unobserved factors, but instead, an observable variable, i.e. the current real interest rate in the economy." More discussion from Reis follows. I don't know if having the central bank pay an inflation-adjusted return on bank reserves is a good idea, but I certainly agree with Reis's premise that thinking about different ways conduct monetary policy through interest on bank reserves is really just getting underway. In "Mortality and morbidity in the 21st century," Princeton Professors Anne Case and Angus Deaton, a Nobel Prize winner, follow-up their groundbreaking 2015 research that documented a dramatic increase in middle-aged white mortality. In their new paper, the authors find that “deaths of despair” (deaths by drugs, alcohol, and suicide) in midlife rose most dramatically for white non-Hispanic Americans with a high school degree or less—a pattern that diverges sharply from overall midlife mortality rates in other rich countries. When combined with a slowdown in progress against mortality from heart disease and cancer—the two largest killers in middle age—the increase in “deaths of despair” since the late 1990s has resulted in midlife mortality rates for white non-Hispanic Americans with a high school degree or less overtaking overall midlife mortality rates of minority groups. In "Along the watchtower: The rise and fall of U.S. low-skilled immigration," Gordon Hanson, Chen Liu, and Craig McIntosh of the University of California San Diego project that immigration to the U.S. of young, low-skilled workers from Latin America will continue to slow until it reverses in 2050—even without changes to U.S. immigration and border policy—thanks to weak labor-supply growth in Mexico and other Latin American countries. Furthermore, the population of Latin American-born residents already in the U.S. over age 40 will grow by 82 percent over the next 15 years, presenting a bigger challenge for U.S. policymakers than how to stop or slow low-skilled immigration. “The current U.S. debate about immigration policy has a backward-looking feel to it. The challenge isn’t how to stop large-scale labor inflows, which has largely been achieved, but how to manage a large, settled population of undocumented immigrants. Massive investments in building border barriers or expanding the U.S. Border Patrol are not going to address this challenge," the authors argue. In "The disappointing recovery of output after 2009," the Federal Reserve Bank of San Francisco's John Fernald, Stanford's Robert Hall, Harvard's James Stock, and Princeton's Mark Watson find that the unexpectedly slow growth since 2009 in output—the economy’s measure of growth—is unlikely to improve because it has been caused by structural, non-cyclical factors and not just the financial crisis and subsequent recession. The authors also find evidence that weak government spending at all levels delayed the recovery. They attribute some of the unusually slow growth early in the recovery to cuts in federal spending from the sequester, the end of the of fiscal stimulus from the American and Reinvestment Recovery Act (ARRA), and changes in state and local level spending due to the recession’s causing home prices to collapse, which in turn impacted property tax receipts. In “Monetary policy in a low interest-rate world,” the Federal Reserve Board’s Michael T. Kiley and John M. Roberts find that rates could hit zero as much as 40 percent of the time—twice as often as predicted in work by others—according to standard economic models of the type used at the Federal Reserve and other central banks. The constraint on monetary policy imposed by frequent episodes of interest rates at zero could make it harder for the Fed to achieve its 2 percent inflation objective and full employment, and the analysis suggests that a monetary policy that tolerates inflation in good times near 3 percent may be necessary to bring inflation to 2 percent on average. As a result, there are a number of steps the Federal Reserve and other central banks can take to help better achieve full employment and price stability in this low interest-rate environment. "In “Is Europe an optimal political area?” Harvard University’s Alberto Alesina, Bocconi University’s Guido Tabellini and University of British Columbia’s Francesco Trebbi analyze cultural indicators across 15 EU countries and Norway from 1980-2009 to determine if the so-called European political project was “too ambitious.” The authors find cultural differences among Europeans are increasing and nationalism is on the rise despite several decades of economic and political integration. The authors believe the EU is at a crossroads: It must choose between the benefit of economies of scale for environmental protection, immigration, terrorism, foreign policy, and promoting research and innovation versus the cost of rising nationalism. While a majority of Europeans seems to favor more EU-level decision-making, they seem dissatisfied with how those policies are being implemented and they disagree along national lines. "Productivity is a gift for rising living standards, perhaps the greatest gift. It is not, however, one that always keeps on giving ..." So said Andrew G. Haldane, the chief economist at the Bank of England, in his talk on "Productivity Puzzles" delivered at the London School of Economics on March 20, 2017. Some of the talk focuses on UK experience in particular: here, I want to focus on Haldane's broader perspective on global productivity growth, and on his intriguing argument that from a global perspective, most of the productivity slowdown can be attributed to a failure of innovation to diffuse across countries as rapidly as in the past. Here's a figure showing the pattern of productivity growth worldwide since the 1950s, and then a figure showing the same productivity data divided into advanced and emerging economies. First, the slowdown of productivity growth has clearly been a global phenomenon, not a UK-specific one. 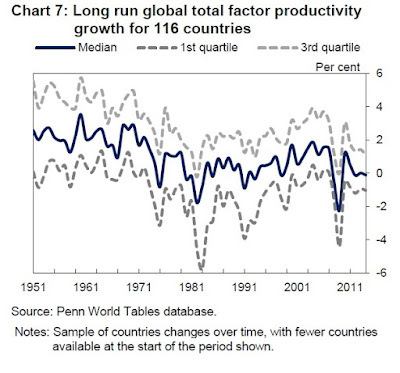 From 1950 to 1970, median global productivity growth averaged 1.9% per year. Since 1980, it has averaged 0.3% per year. 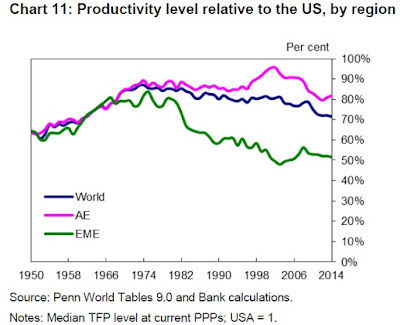 Whatever is driving the productivity puzzle, it has global rather than local roots. 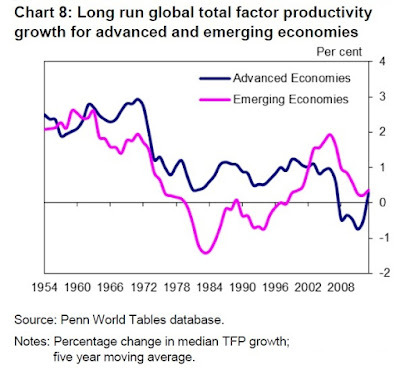 Second, this global productivity slowdown is clearly not a recent phenomenon. It appears to have started in many advanced countries in the 1970s. Certainly, the productivity puzzle is not something which has emerged since the global financial crisis, though it seems the crisis has amplified pre-existing trends. Explanations for the productivity puzzle based on crisis-related scarring are likely to be, at best, partial. "Growth theory would predict that, over time, technological diffusion should lead to catch-up between frontier and non-frontier countries. And the greater the distance to the frontier, the faster these rates of catch-up are likely to be. 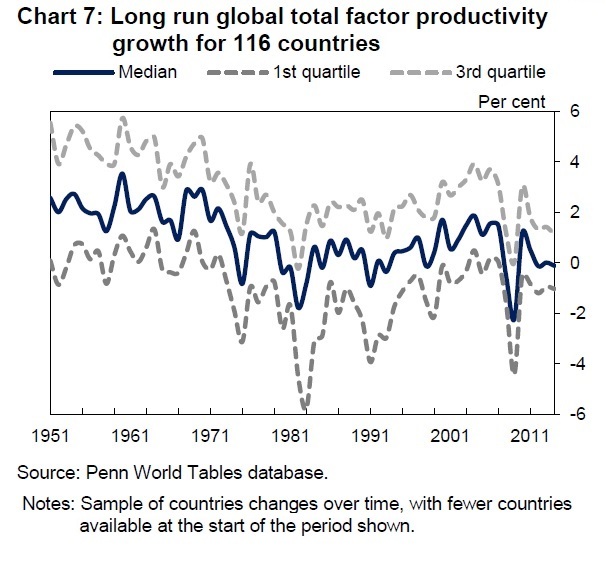 So what explains the 1¾ percentage point slowdown in global productivity growth since the 1970s – slower innovation at the frontier or slower diffusion to the periphery? If the frontier country is taken to be the United States, then slowing innovation can only account for a small fraction of the global slowing, not least because the US only has about a 20% weight in world GDP. In other words, the lion’s share of the slowing in global productivity is the result of slower diffusion of innovation from frontier to non-frontier countries. 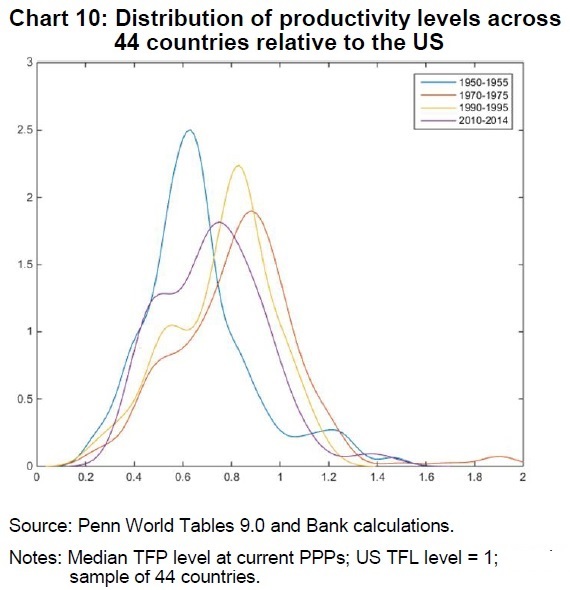 "To illustrate that, Chart 10 plots the distribution of levels of productivity across countries over a set of sample periods, where productivity is measured relative to a frontier country (the United States) indexed to one. Comparing the distributions in the 1950s and 1970s, there is a clear rightward shift. Cross-country productivity convergence or catch-up was underway, as the Classical growth model would suggest. In recent decades, however, that pattern has changed. Comparing the 1970s with the 1990s, there is a small leftward shift in the probability mass. And in the period since the global financial crisis, there has been a further leftward shift in the distribution and a widening of its range. Today, non-frontier countries are about as far from the technological frontier as they were in the 1950s." 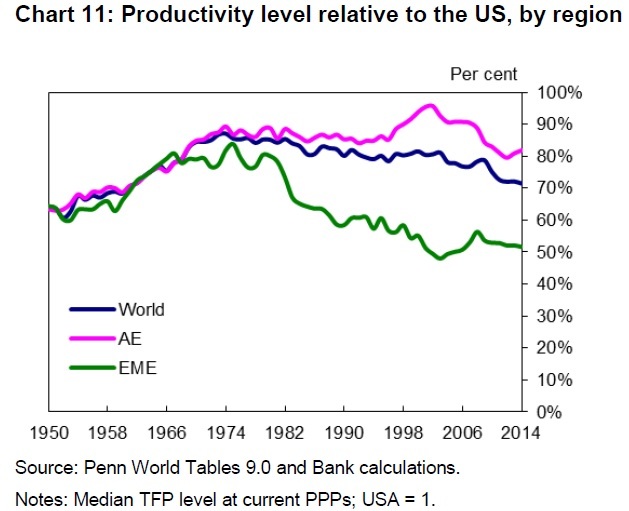 Haldan also offers a graph showing productivity level relative to the US: again, emerging market economies show convergence toward the US level of productivity from the 1950s up through the 1970s, but then shows a divergence in much of the 1980s and 1990s--with no particular convergence or divergence since about 2000. "One of the key determinants of international technology transfer has been found to be cross-border flows of goods and services, people and money and capital. While they have waxed and waned historically, all of these have tended to rise rapidly since the middle of the 20th century. Other things equal, that would have been expected to increase the speed of diffusion of innovation across countries over that period. In practice, the opposite appears to have occurred. "Taken at face value, these patterns are both striking and puzzling. Not only do they sit oddly with Classical growth theory. They are also at odds with the evidence of history, which has been that rates of technological diffusion have been rising rather than falling over time, and with secular trends in international flows of factors of production. At the very time we would have expected it to be firing on all cylinders, the technological diffusion engine globally has been misfiring. This adds to the productivity puzzle. 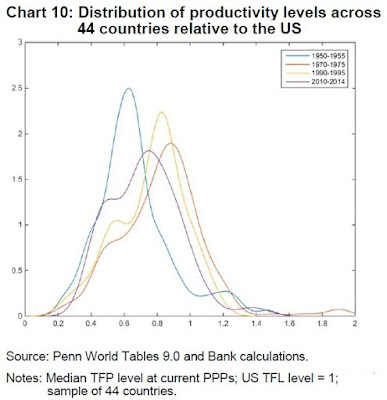 I'll only add that any view of the US productivity slowdown is likely to be incomplete if it doesn't take into account that it's a long-term issue, with a global dimension, and that a decline in the diffusion of productivity seems to be involved. "First, starting around the end of the 1980s, we see the adoption of incentive-based pay for CEOs and other highly placed managers. Incentive compensation over this time rises, and it happens to be that the incentive compensation is not based on relative performance, which would therefore difference out what goes on in the macroeconomy, but instead is based on absolute performance. And in the U.S. case, that could partly be due to simply what counts legally as incentive-based compensation and so is not subject to corporate profits tax. Pay in the form of stock options, for example, counts as incentive-based compensation. Pure salary does not and so is taxed as corporate profits above $1 million. "The other possibility is that ... new information and communication technologies allow the best managers to manage more people, to run bigger companies, and therefore to earn more; the best investment managers to manage more money and to make more for themselves; the best entertainers and performers to reach more people and therefore earn a larger share of the spending on entertainment goods. High earners have become small businesses. 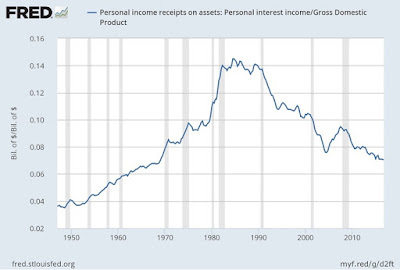 ... We do know that increased cyclicality in income among high earners can't come simply from the financial sector. That sector just isn't quantitatively big enough, and you see the increase in earnings share and in cyclicality across industries and occupations. It's not the case that just the top hedge fund managers have become the high earners and they're very cyclical; Oprah is also." Why don't households smooth consumption? "So the question is how many people are influenced by constraints in practice. Is their marginal propensity to consume noticeably influenced by the fact that they might be constrained next month or in six months? I would say that's quantitatively important for roughly half of the population. ... I don't think there's a lot of transition between the people who would consistently hit these constraints or be concerned about them and the people for whom they're not that relevant." "The BLS [Bureau of Economic Statistics] is revising the CE Survey now. It's called the Gemini Project, and I have been involved a little with advising how to revamp it. Surveys in general have been experiencing problems with participation and reporting. The CE is suffering from these problems, and so the Gemini Project is trying to address them. The CE has the huge benefit of being a nationally representative survey done by the Census Bureau; almost all of the alternative datasets that we're using from administrative sources that are not strictly survey datasets are less representative. So reducing the CE's problems with participation and reporting could potentially have a very large payoff. Of course, the cost of the change is that the CE Survey as it stands now is a very long panel dataset that has had the same format throughout the whole time. So we're going to break that and no longer be adding new time periods to an intertemporally comparable dataset. But I think that's probably a cost worth paying at this point. "What the BLS is planning is to change dramatically the way the CE Survey is conducted. They're going to gather data in quite different ways than they have in the past, including some spending categories that will almost have so-called administrative sources. What I have been pushing for is maintaining some panel dimension in the new version of the CE Survey. If you don't have a panel dimension, then for lots of macro-type questions, you can track people only at the group level. And since groups are usually affected differently by other things going on in the world, you lose a lot of ability to identify stuff that might be interesting — tracking someone who had a specific policy exposure in one period and seeing how they're doing a month or a year later. If the BLS eliminates the panel dimension, researchers couldn't do anything like I did with my tax rebates work, nor any other work that looks at treatments that are happening at the individual level. But I'm hoping that the new, state-of-the-art version of the CE Survey will last another 35 years and be just as good." "Indeed, in the past twenty-five years, every time India achieved a slightly higher economic growth rate, it was followed by some combination of an external financing deficit, a rise in nonperforming assets in the banking system, a high rate of inflation with consequent currency overvaluation, and other problems. This was the case at the end of the 1970s, at the end of the 1980s, and again in 2012–2013." A main theme of the report the problems that India needs to overcome to lay a firm foundation for sustained economic growth into the future. While the report often takes a moderately optimistic glass-half-full tone, discussing what policies are being undertaken, I found that I was more struck by the glass-half-empty interpretation--that is, the depth and severity of many of these issues. 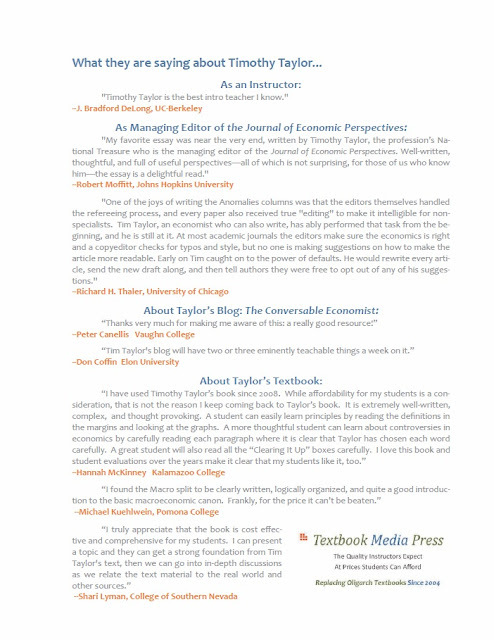 Here are some examples (with footnotes omitted throughout for readability). "A 2010 study by the Tata Institute of Social Sciences in Mumbai found that only 10 percent of new graduates and 25 percent of graduates of engineering and MBA programs had adequate skills to be employable. Numerous other surveys have confirmed the results." "A ... major labor market deficiency is the country’s shockingly low female workforce participation rate. At 24 percent in 2014, it was comparable to levels in the Middle East and North Africa, and just half that in Indonesia. A 2015 report from the McKinsey Global Institute showed that the female contribution to India’s GDP, at 17 percent, is the lowest in the world among a sample constituted of countries and regions, and less than half the global female share of GDP at 37 percent. The report estimates that if India did as well as the best-performing country in South Asia on this metric, by 2025 its incremental output would be higher by 16 percent, or $700 billion. But this would require, even more than enabling public policies, a social transformation on a scale equivalent to that which led to the weakening of caste barriers in Indian society in the latter part of nineteenth century and the early twentieth century." authorities and other regulators. 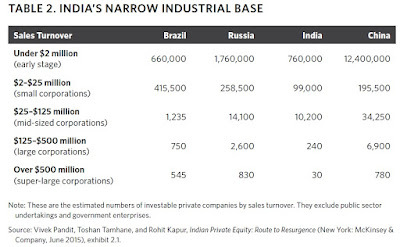 ... India’s industrial base has a gaping hole in the middle. 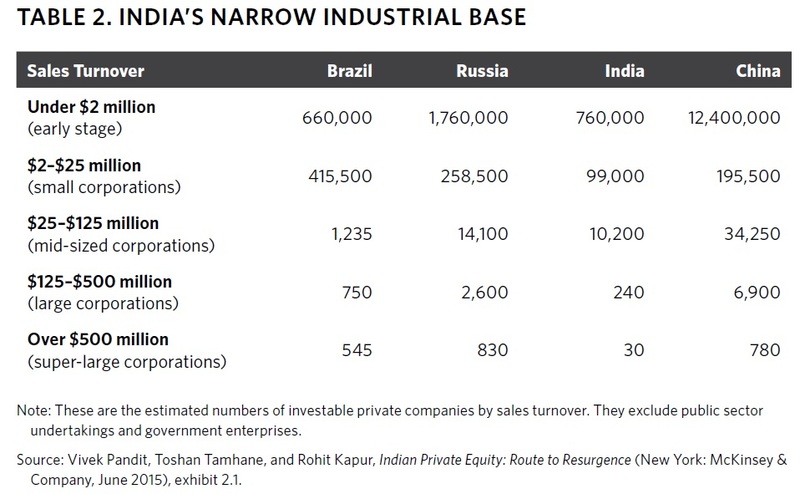 Specifically, India has a preponderance of microenterprises and a tiny set of large enterprises. It has neither small nor medium-sized enterprises." "A statistical update on employment in the informal economy published by the International Labor Organization in 2012 showed that India has one of the world’s largest informal sectors. At 83.6 percent, the share of informal employment in the country’s overall nonagricultural employment total is the highest in the world. Furthermore, India’s labor force participation rate is one of the lowest in the world. Only Egypt and Honduras fare worse." 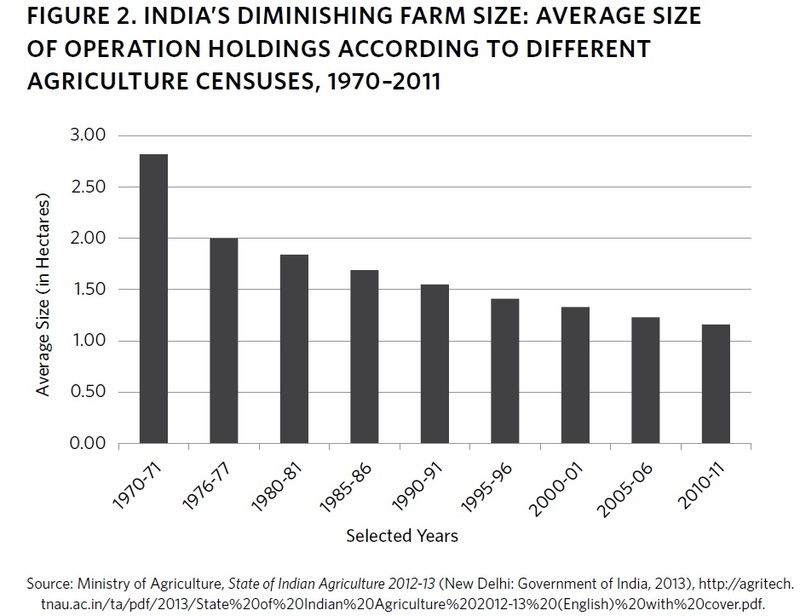 "The economic historian Robert Allen has documented India’s capital accumulation shortfall. 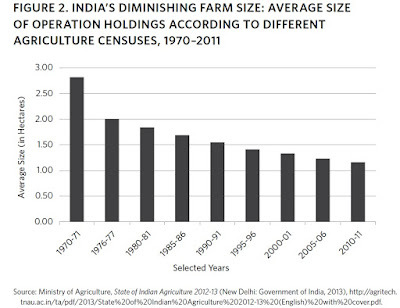 He writes, “Between 1860 and 1990, it [India] accumulated little capital and achieved little growth. Its capital-labor ratio in 1990 ($1,946) and labor productivity ($3,235) were like Britain’s in 1820 ($1,841 and $4,408, respectively).” Comparing the development trajectories of seventeen countries in the 1820–1990 period, he argues that developing countries such as India “need to accumulate capital in the massive way that East Asian economies have done since 1960 in order to close the gap with the West.” That gap is a huge one to close. 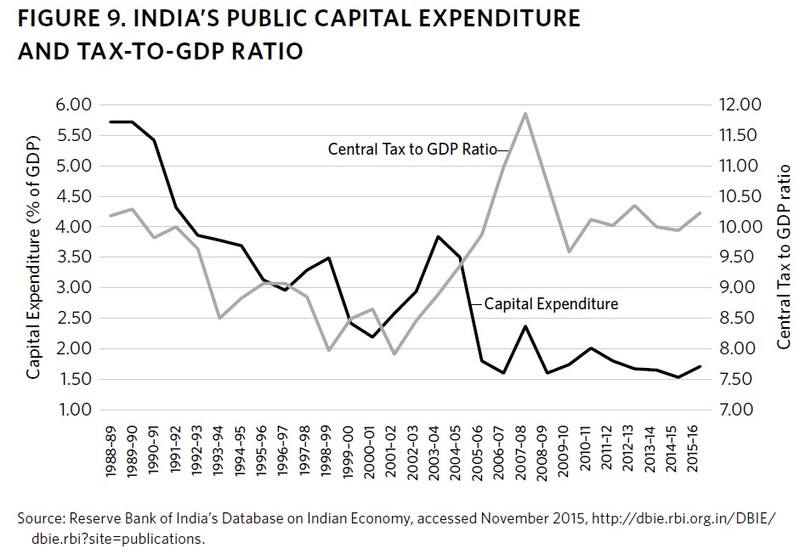 Unfortunately, India is constrained by its low savings rate and narrow capital base, both of which constrain it from generating the capital required to sustain a high economic growth rate for a sufficiently long period." "The narrow industrial base and limited pool of middle-class taxpayers is nowhere reflected more starkly than in the country’s very low tax-to-GDP ratio. India has one of the lowest ratios among the G20 countries—far lower than Brazil’s, for example. Despite India’s large population, the country’s income tax base is comparable to that of a small European country. In 2012–2013 there were just 31.19 million assessees, or less than 3 percent of the 1.2 billion population, in contrast to 147 million assessees in 2013 among 316 million people in the United States." "The inability to implement government programs is pervasive and dominates the public’s perception of weak governance. India’s government-run schools are noteworthy for neglect and apathy. Teacher absenteeism is rampant; learning levels are abysmal; toilets, where available, are mostly nonfunctional; and so on. In healthcare, doctor and nurse absenteeism is very high, and the quality of primary care services is unacceptable. Even when resources and personnel are made available, most large government-run hospitals remain badly managed. In both sectors, well-designed national programs with adequate implementation flexibility have fallen far short of expectations when subjected to the field test of implementation. "Inordinate delays in fixing a leaking pipeline or repairing potholes, let alone building new roads or drilling wells, and slow garbage collection are frustrations familiar to most Indians. The execution of small panchayat (the unit of administration at the village level) works, even when contracted and the money made available, takes months to years. And despite the existence of progressive and comprehensive legislation on social protection, atrocities against lower castes, children, and women continue unabated. "Supervisory systems, even when not compromised, struggle to enforce regulations. The commanding sectors of modern India, infrastructure and urban facilities, are marred by the same malaise. The capacity to design and document projects, manage procurements, mobilize financial resources, finalize contracts, and manage the execution effectively is sorely lacking even at the highest levels of state and national government. It is no surprise that contracting corruption, execution delays, and renegotiations have become quotidian in these sectors." "One of the defining features of successful economic growth over long periods in the recent past has been the central role of exports. The most prominent example is that of East Asia, where long periods of economic growth were sustained by strong export growth, in particular driven by the manufacturing sector. India clearly exports a far smaller share of its output than did any of the East Asian economies during their high-growth periods. The prospects for the manufacturing sector becoming the engine of India’s growth do not appear promising, owing to the structural shifts taking place in the global economy and the concomitant trend of premature deindustrialization. More worryingly, the prospect of exports becoming a main driver of economic growth also looks bleak." These issues mostly suggest their own solutions, but implementation isn't easy or straightforward. The bottom line of the report is that India's economy has enough strong areas that 4-5% annual GDP growth remains quite possible. But it's worth remembering that when it comes to per capita GDP, India ranks 150th among the countries of the world, at a level similar to Nigeria and Congo. Annual growth rates of 4-5% would mean that India barely keeps pace with other emerging market economies like China, or gradually falls behind. 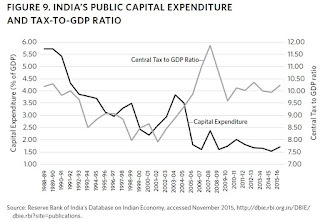 For another recent post on India's economy, see my overview of the most recent Economic Survey from India's Ministry of Finance in "The Economic Vision for Precocious, Cleavaged India" (February 16, 2017). Here at the Conversable Economist blog, we (that would be me) interrupt the usual parade of economics articles, report, graphs, and figures to bring you a commercial message. 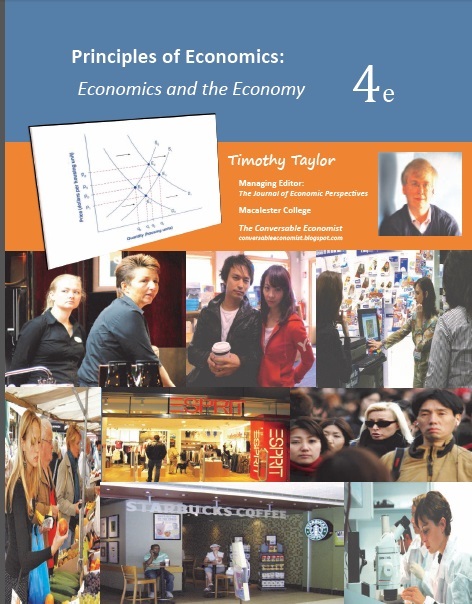 The fourth edition of my Principles of Economics textbook is now available. It is mainstream in content, well-written, and fairly priced. It offered me a chance for me to unpack my personal toolkit of how to explain this material: that is, my preferred order for the material, step-by-step conceptual explanations, metaphors, historical and modern examples, evocative graphs and tables, quotations, parables, and more. 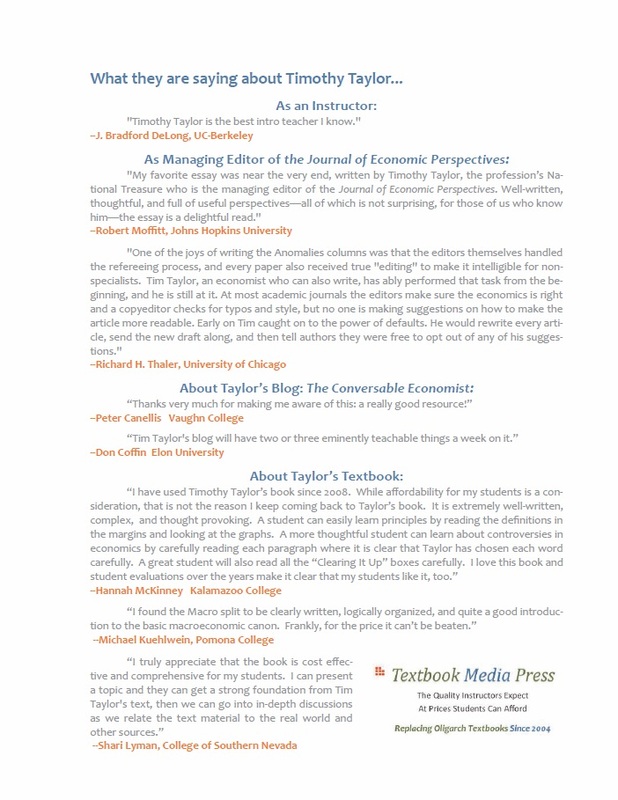 If you're actively looking at possible textbooks for next fall, or perhaps just keeping track of what's out there, I commend it to your attention. Here's are shots of the front and back covers, which includes a few nice comments from current users. The most fundamental tradeoff that individuals face is time: no matter your income, education level, gender, ethnicity, we all get precisely 1,440 minutes each day, and 168 hours each week. The American Time Use Survey, conducted by the Census Bureau, surveys a nationally representative group Americans on their use of time. Here are some patterns of American leisure. 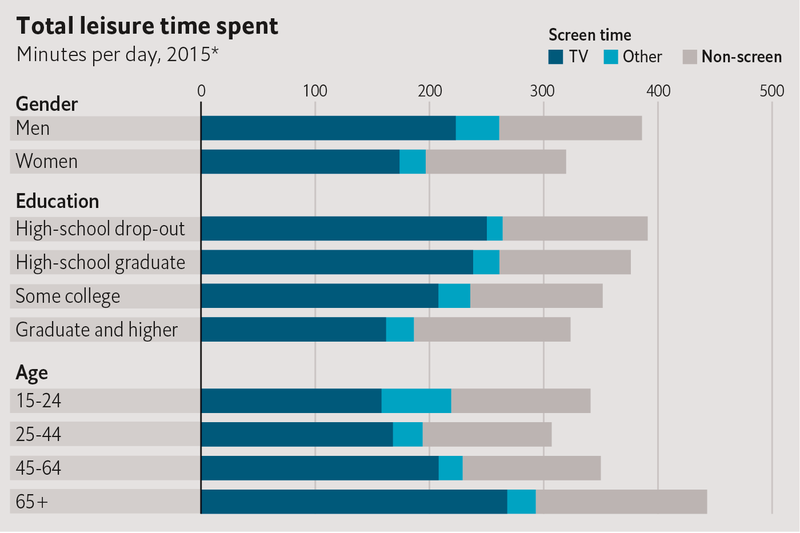 Americans average about five hours of leisure time each day, and they spend 55% of that time watching television. 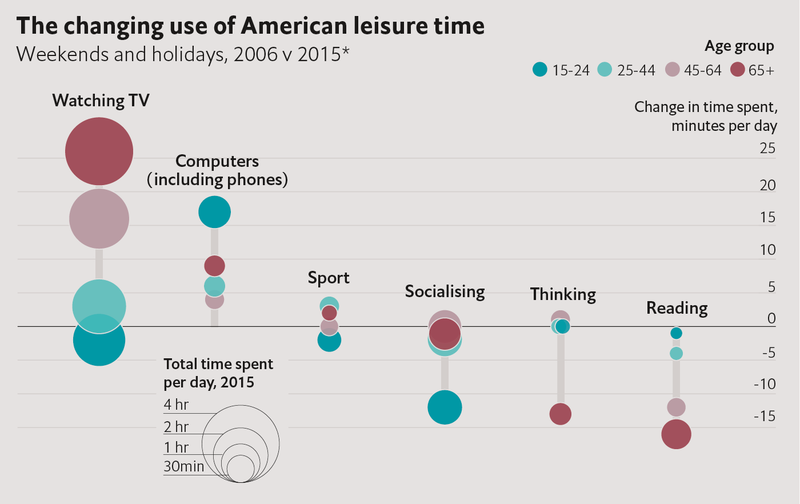 In the April/May issue of 1843 magazine (published by The Economist), James Tozer digs down into the American Time Use Survey data a little further, in a short "What the numbers say" article on "Leisure time." 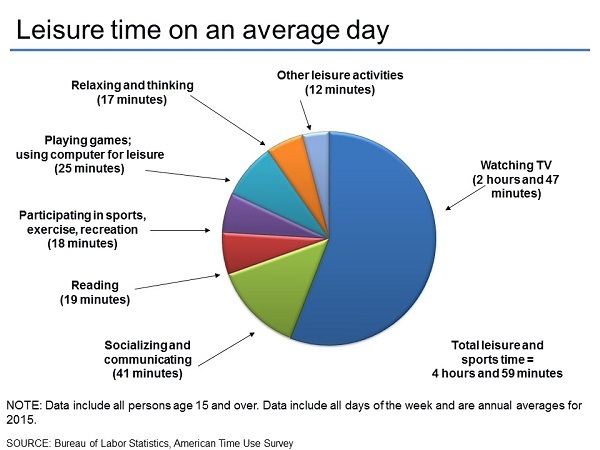 For example, here's a breakdown of total leisure per day, in minutes, by demographic categories. Men, the less educated, and the elderly tend to have more leisure time. Tozer also looks at how leisure time changes between 2006 and 2015. In this figure, the size of the circles is proportional to how much time was spent on leisure time just on weekends and holidays. 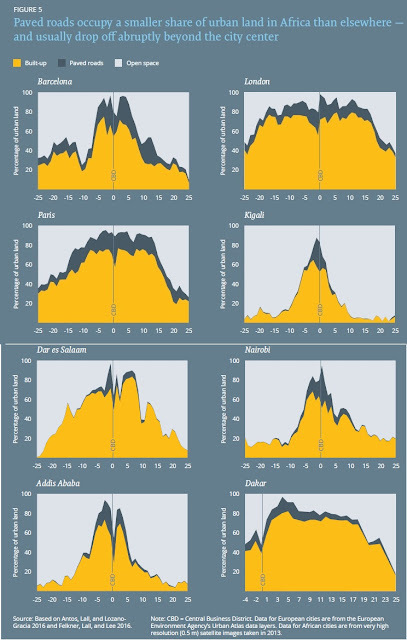 The different colors show age groups. The axis on the right-hand side shows how time spent in these categories shifted from 2006-2015. Thus, older folks are watching more TV and spending less time on reading and thinking. Younger folks are spending a little less time watching TV, a lot less time socializing, and a lot more time on their computers and phones. Economists sometimes quote the old proverb: "De gustibus non est disputandum." There's no arguing over taste. We tend to accept consumer tastes and preferences as given, and proceed from there. I suppose that those of us who blog, and then hope for readers, can't really complain about those who spend time looking at a screen. I certainly have my own personal time-wasters, like reading an inordinate number of mysteries. I assume that for many people the television is on in the background of other activities. But at some deep level, I just don't understand averaging 8 hours of television per day [per household]. I always remember the long-ago jibe from the old radio comedian Fred Allen:"Television is a medium because anything well done is rare." Crowded, not economically dense — investments in infrastructure, industrial and commercial structures have not kept pace with the concentration of people, nor have investments in affordable formal housing; congestion and its costs overwhelm the benefits of urban concentration. Disconnected — cities have developed as collections of small and fragmented neighborhoods, lacking reliable transportation and limiting workers’ job opportunities while preventing firms from reaping scale and agglomeration benefits. Costly for households and for firms — high nominal wages and transaction costs deter investors and trading partners, especially in regionally and internationally tradable sectors; workers’ high food, housing, and transport costs increase labor costs to firms and thus reduce expected returns on investment. .. When urban costs drive nominal wages too high, firms will not be able to compete in the tradable sector and will produce only nontradables. The nontradable sector includes certain goods (beer and cement are examples), the construction trade, the retail trade, and many service sector activities, including informal sector employment. Demand for these goods and services comes from income generated within the city and its hinterland — but also from income transferred from outside, such as resource rents, tax revenues, and foreign aid. The reason why a firm in the nontradable sector can afford to pay higher wages — while a firm in the tradable sector cannot — is that the nontradable producer can raise its prices citywide. By doing so, it passes its own cost increases on to consumers in the urban market. But such price hikes make the cost of living in a city even higher, contributing to the workers’ urban costs. This sequence can become a vicious cycle that keeps African cities out of the tradable sector and limits their economic growth. "In eight representative African cities, roads occupy far lower shares of urban land than in other cities around the world." "Related to the predominance of informal housing near African city centers is their relative lack of built-up area. For example, in both Harare, Zimbabwe and Maputo, Mozambique, more than 30 percent of land within five kilometers of the central business district remains unbuilt. This land near the core is not left unbuilt by design in African cities, as it can be in well-developed downtowns such as Paris (which reserves 14 percent of downtown land for green space, making densely populated districts more livable). Instead, outdated and poorly enforced city plans, along with dysfunctional property markets, create inefficient land use patterns that no one intended. The downtown lacks structures — despite being crowded." "Without adequate formal housing in reach of jobs, and without transport systems to connect people living farther away, Africans forgo services and amenities to live in cramped quarters near their work. ... Across Africa, 60 percent of the urban population is packed into slums— much higher than the 34 percent seen elsewhere." "African households face higher costs relative to their per capita GDP than households in other regions. ... Housing and transport are especially costly in urban Africa. Relative to their income levels, urban residents pay 55 percent more for housing in Africa than they do in other regions. Urban transport, which includes prices of vehicles and transport services, is about 42 percent more expensive in African cities than in cities elsewhere. ... For the poorest urban residents especially, the cost of vehicle transport in some cities is prohibitive. The need to walk to work limits these residents’ access to jobs. The price premium for food is also large (about 35 percent)." "African cities also are disconnected in that they are spatially dispersed. Structures are scattered in small neighborhoods. Without adequate roads or transport systems, commuting is slow and costly, denying workers access to jobs throughout the larger urban area. People and firms are separated from each other and from economic opportunity. And because urban form is determined by long-lived structures that shape the city for decades — if not centuries — cities that assume a disconnected form can easily become locked into it. ... African cities are 20 percent more fragmented than are Asian and Latin American ones." First, formalize land markets, clarify property rights, and institute effective urban planning. Second, make early and coordinated infrastructure investments that allow for interdependence among sites, structures, and basic services. A third goal is to improve urban transport and additional services. But this must not come ahead of the two goals listed above — nor can it be achieved unless those are met first. 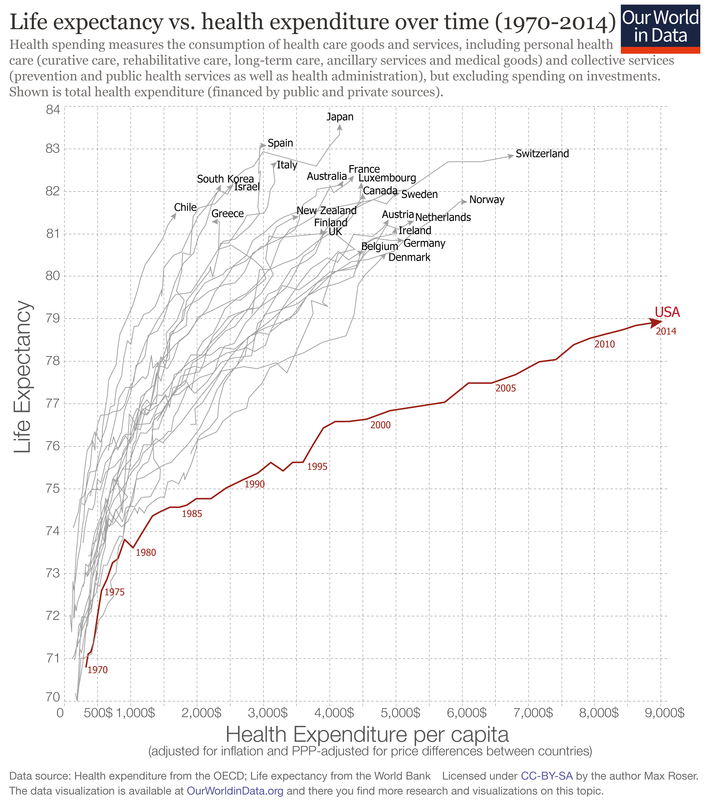 I suppose that anyone who is paying attention to US health care issues knows the basic pattern: the US spends much more on health care on a per capita basis, but life expectancy and other health outcomes in the US are often less than in comparable countries. But here's a striking figure created by Max Roser in July 2016 making this point, and available as one of many useful figures at "Financing Healthcare," by Esteban Ortiz-Ospina and Max Roser, at their "Our World in Data" website. The figure shows patterns of health spending and life expectancy in various high-income countries from 1970 to 2014. Around 1970, all the countries are down in the bottom left corner of the figure. Over time, both health spending and life expectancy rise everywhere. But as you can see, the US is an outlier. Over the last 45 years or so, US health spending rises to much higher levels than in other countries, while the gains in life expectancy have been much more modest. The US political arguments over health care have pretty much ignored this pattern: that is, we argue back and forth over costs and coverage of US health insurance, but we spend relatively little time thinking about what public policy steps would most improve health. It's a question of opportunity cost: when the government devotes so much of its spending and so much of its support for those with low incomes to health care spending, other possibilities for social spending are inevitably constricted. For a previous post arguing that a substantial share of health spending is wasted, both in the US and around the world, see "Wasteful Health Care Spending" (February 23, 2017). Homage: I ran across this figure at Mark Thoma's ever-useful "Economist's View" blog. The idea of a Pigouvian tax traces back to the classic 1920 book by Arthur C. Pigou, The Economics of Welfare. The concept is straightforward. There are certain situations, like those involving pollution, where the unregulated producer of a good does not need to take the social costs of pollution into account. As a result, the private costs of production are not equal to the social costs. In such a situation, one can make a case for the government to impose a tax--a "Pigouvian tax"--which forces the producer to pay for the social costs that it is imposing. In Part II, Chapter IX of the 1920 book, Pigou discusses "Divergences Between Marginal Social Net Product and Marginal Private Net Product." He offers a clear statement of what modern economists mean by a Pigovian tax, but in the course of explaining the economic logic also provides some ammunition to those who fear that government may have quite a difficult time in applying such taxes. I quote here from the version of Pigou's book available at the always-useful Library of Economics and Liberty website. "Among these examples we may set out first a number of instances in which marginal private net product falls short of marginal social net product, because incidental services are performed to third parties from whom it is technically difficult to exact payment. Thus, as Sidgwick observes, "it may easily happen that the benefits of a well-placed light-house must be largely enjoyed by ships on which no toll could be conveniently levied. "Again, uncompensated services are rendered when resources are invested in private parks in cities; for these, even though the public is not admitted to them, improve the air of the neighbourhood. The same thing is true—though here allowance should be made for a detriment elsewhere—of resources invested in roads and tramways that increase the value of the adjoining land—except, indeed, where a special betterment rate, corresponding to the improvements they enjoy, is levied on the owners of this land. It is true, in like manner, of resources devoted to afforestation, since the beneficial effect on climate often extends beyond the borders of the estates owned by the person responsible for the forest. It is true also of resources invested in lamps erected at the doors of private houses, for these necessarily throw light also on the streets. It is true of resources devoted to the prevention of smoke from factory chimneys: for this smoke in large towns inflicts a heavy uncharged loss on the community, in injury to buildings and vegetables, expenses for washing clothes and cleaning rooms, expenses for the provision of extra artificial light, and in many other ways.Lastly and most important of all, it is true of resources devoted alike to the fundamental problems of scientific research, out of which, in unexpected ways, discoveries of high practical utility often grow, and also to the perfecting of inventions and improvements in industrial processes. These latter are often of such a nature that they can neither be patented nor kept secret, and, therefore, the whole of the extra reward, which they at first bring to their inventor, is very quickly transferred from him to the general public in the form of reduced prices. The patent laws aim, in effect, at bringing marginal private net product and marginal social net product more closely together. By offering the prospect of reward for certain types of invention they do not, indeed, appreciably stimulate inventive activity, which is, for the most part, spontaneous, but they do direct it into channels of general usefulness." "The private net product of any unit of investment is unduly large relatively to the social net product in the businesses of producing and distributing alcoholic drinks. Consequently, in nearly all countries, special taxes are placed upon these businesses. Marshall was in favour of treating in the same way resources devoted to the erection of buildings in crowded areas. He suggested, to a witness before the Royal Commission on Labour, "that every person putting up a house in a district that has got as closely populated as is good should be compelled to contribute towards providing free playgrounds. "The principle is susceptible of general application. It is employed, though in a very incomplete and partial manner, in the British levy of a petrol duty and a motor-car licence tax upon the users of motor cars, the proceeds of which are devoted to the service of the roads. It is employed again in an ingenious way in the National Insurance Act. When the sickness rate in any district is exceptionally high, provision is made for throwing the consequent abnormal expenses upon employers, local authorities or water companies, if the high rate can be shown to be due to neglect or carelessness on the part of any of these bodies." In short, Pigou back in 1920 was offering an economic justification for taxes on alcohol and gasoline, as well as for property taxes used to support local parks and amenities. This all holds together as a matter of theory and logic. But as usual when moving from theory to policy, the devil is in the details. Here, I'll point to two sets of concerns that arise from reading Pigou. In any industry, where there is reason to believe that the free play of self-interest will cause an amount of resources to be invested different from the amount that is required in the best interest of the national dividend, there is a prima facie case for public intervention. The case, however, cannot become more than a prima facie one, until we have considered the qualifications, which governmental agencies may be expected to possess for intervening advantageously. It is not sufficient to contrast the imperfect adjustments of unfettered private enterprise with the best adjustment that economists in their studies can imagine. For we cannot expect that any public authority will attain, or will even whole-heartedly seek, that ideal. Such authorities are liable alike to ignorance, to sectional pressure and to personal corruption by private interest. A loud-voiced part of their constituents, if organised for votes, may easily outweigh the whole. This objection to public intervention in industry applies both to intervention through control of private companies and to intervention through direct public operation. On the one side, companies, particularly when there is continuing regulation, may employ corruption, not only in the getting of their franchise, but also in the execution of it. ... On the other side, when public authorities themselves work enterprises, the possibilities of corruption are changed only in form. ... [Here Pigou quotes the US-based Report to the National Civic Federation on Municipal and Private Operation of Public Utilities.] "Every public official is a potential opportunity for some form of self-interest arrayed against the common interest." "... when the owner of a site in a residential quarter of a city builds a factory there and so destroys a great part of the amenities of the neighbouring sites; or, in a less degree, when he uses his site in such a way as to spoil the lighting of the houses opposite: or when he invests resources in erecting buildings in a crowded centre, which, by contracting the air space and the playing-room of the neighbourhood, tend to injure the health and efficiency of the families living there." "Perhaps, however, the crowning illustration of this order of excess of private over social net product is afforded by the work done by women in factories, particularly during the periods immediately preceding and succeeding confinement; for there can be no doubt that this work often carries with it, besides the earnings of the women themselves, grave injury to the health of their children. ... [P]rohibition of such work should be accompanied by relief to those families whom the prohibition renders necessitous." "For, in some measure, people's affection for the best quality of anything is due simply to the fact that it is the best quality; and, when a new best, superior to the old best, is created, that element of value in the old best is destroyed. Thus, if an improved form of motor car is invented, an enthusiast who desires above all "the very latest thing" will, for the future, derive scarcely any satisfaction from a car, the possession of which, before this new invention, afforded him intense pleasure. In these circumstances the marginal social net product of resources invested in producing the improved type is somewhat smaller than the marginal private net product." "The private net product of any unit of investment is unduly small in industries, such as agriculture, which are supposed to yield the indirect service of developing citizens suitable for military training. Partly for this reason agriculture in Germany was accorded the indirect bounty of protection." "Thus it is coming to be recognised as an axiom of government that, in every town, power must be held by some authority to limit the quantity of building permitted to a given area, to restrict the height to which houses may be carried,—for the erection of barrack dwellings may cause great overcrowding of area even though there is no overcrowding of rooms,—and generally to control the building activities of individuals. It is as idle to expect a well-planned town to result from the independent activities of isolated speculators as it would be to expect a satisfactory picture to result if each separate square inch were painted by an independent artist. No "invisible hand" can be relied on to produce a good arrangement of the whole from a combination of separate treatments of the parts. It is, therefore, necessary that an authority of wider reach should intervene and should tackle the collective problems of beauty, of air and of light, as those other collective problems of gas and water have been tackled. ... Furthermore, it may, if desired, be extended to include land on which buildings have already been put up, and may provide "for the demolition or alteration of any buildings thereon, so far as may be necessary for carrying the scheme into effect."" "[I]t may happen that the expenditures on advertisement made by competing monopolists will simply neutralise one another, and leave theindustrial position exactly as it would have been if neither had expended anything. For, clearly, if each of two rivals makes equal efforts to attract thefavour of the public away from the other, the total result is the same as it would have been if neither had made any effort at all." As these examples (and Pigou offers others) suggest, the idea of Pigouvian taxes and bounties applies in any and every situation where someone can make an argument that someone else is affected by a market transaction--even if just makes someone feel bad when someone else buys a new product. It seems to me that almost every public policy argument can be framed in terms of avoiding social costs or gaining social benefits. Again, remember that these arguments are not being made among pure-hearted truth-seekers, but rather in a political setting. Thus, a question arises of how one disciplines the process of deciding when the Pigouvian logic applies. For example, it's common on one side to hear arguments that there is a case for Pigouvian bounties to subsidize the research and development that leads to new innovations and higher productivity. On the other side, it's common to hear arguments that there is a Pigouvian case for limiting robots or other new innovations so that they don't impose costs on existing workers. But a set of policies that simultaneously encourage and discourage innovation runs a real risk of expressing our ambivalent feelings about new technology in way that is close to incoherent. A related problem in thinking about Pigovian taxes arises when choosing the tax rate. For example, in the case of alcohol there is some evidence that moderate consumption may have health benefits, through a reduction in blood pressure. However, inappropriate and excessive consumption of alcohol can also lead to drunken driving, violence, fetal alcohol syndrome, and other consequences. Thus, it seems as if the appropriate Pigouvian tax on alcohol should be to subsidize the light social drinker, but to impose a high tax on drinkers who impose high social costs. When the effects of an action on third parties are heterogenous in this way. choosing an appropriate Pigouvian tax becomes tricky, and society may well feel a need for use of alternative or complementary policy tools. Like many economists, I favor certain taxes and subsidies on Pigouvian grounds. But it's worth remembering that the arguments in such cases are not just technocratic, but ultimately involve value judgments about political economy and social welfare.